In my continuing quest to find language partners, I set up a meeting with another Japanese girl to go for food and beer in Shimokitazawa. For the life of me I can’t remember her name, so let’s call her Natsuko. A few days before our meeting, Natsuko texted me to say that she was bringing a female friend, and she asked me to bring a male friend as well. A double date with two 20 something Japanese girls! How hard can it be to find someone to go with me? Due to the short amount of lead time, a lot of the single guys already had plans on Sunday evening. With hours to go, I got a confirmation from Marshall that he would come along. After work I returned home, got cleaned up and ready to go out, only to find that Marshall had decided to stay home and watch TV because the girls couldn’t speak much English and he couldn’t speak much Japanese. No amount of convincing worked, so I ended up leaving for my double date by myself looking like a guy with no friends. After a few minutes of trying to remember the Japanese word for “north”, I was able to leave through the North exit and meet Natsuko and her friend at Shimokitazawa station. We exchanged greetings and I immediately started apologizing for showing up solo, trying to explain that something came up at the last minute. The three of us wandered off towards the bustling streets of Shimokitazawa (a cool place to check out). After some looking around, we decided on a fun looking Vietnamese restaurant. The restaurant was crowded and fun, featuring cheap drinks and small food orders for 380 yen each. 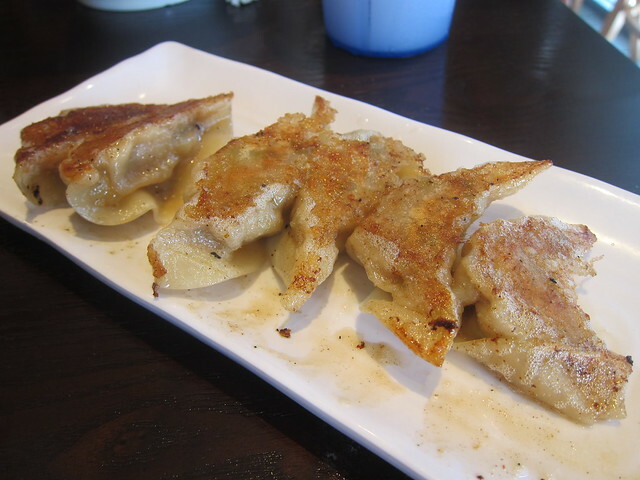 The highlight was Russian Roulette Gyoza, a plate of 4 dumplings. One of the gyoza was loaded full of chili peppers. One of the girls got this, and started shooting fire out of her mouth after one bite. Being a gentleman, I finished the rest of the pepper loaded gyoza. This was the least I could do for not bringing a friend along. Natsuko and her friend had very limited English. We did manage to communicate and have a good time, but I realized that I was going to seriously work on my Japanese. It was a still a fun evening, and I can honestly say that I have been out on a date with two women before. In case “Marshall” or any of the other guys I asked to come with me are reading this – the girls were both really hot and the food was great. You missed out! This entry was posted on November 16, 2013, 9:00 am and is filed under Shenanigans, Tokyo. You can follow any responses to this entry through RSS 2.0. You can leave a response, or trackback from your own site.